Five years ago, Africa RISING scientists were looking for better ways to measure and assess the sustainability of sustainable intensification measures. The five domains of sustainable intensification. 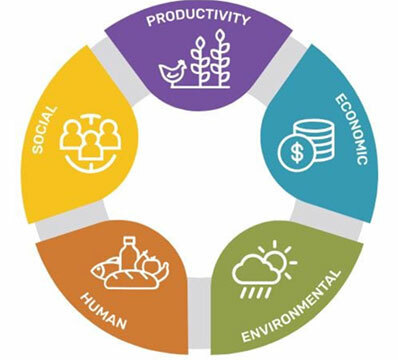 This work led to the development of a sustainable intensification assessment framework (SIAF) to help assess and measure an innovation’s performance in terms of its direct and indirect consequences within and across five critical domains: productivity, economic, environmental, human, and social. In November 2018, the Feed the Future Innovation Lab for Collaborative Research on Sustainable Intensification launched the next iteration of this effort – the SI Toolkit – at the Agronomy Society of America’s annual meeting. The SI Toolkit is a dynamic, online platform to help researchers and development workers select appropriate indicators and metrics for their innovations, visualizing tradeoffs and synergies using a Radar Chart Generator. Try out the toolkit and radar chart generator.